“Lay Down, Lay Low” from their album Lay Down, Lay Low. “Prayer bands on their arms” refers to a phylactery. “Tassels for their clothes” refers to the Tzitzit, which is explained here. Both were part of the Torah. Notice Jesus does not condemn the wearing of the Tzitzit or the phylactery. It is the audaciousness that he condemns. As so often is the case with Jesus, especially in Matthew, he has no problem with the law itself, it is the motivation behind such things that truly matters. After this, he comes down even harder “How terrible it will be for you legal experts and Pharisees! Hypocrites!” The lectionary leaves out these harsh condemnation of the religious experts. Evidence of infighting between Matthean community and Pharisees after the destruction of the Temple. Much of the dangerous rhetoric aimed toward Pharisees could be seen as a family fight that took place as much after Jesus’ time than it did during his ministry. The teachings of the Pharisees and Jesus were not that far off from each other. V. 1-3 Not yet a total condemnation of the Pharisees. Can we hear remnants of “You have heard it said... but I say to you…” It is not so much that the Pharisees are wrong in their teaching, it is in their application of the teaching where they fall short. Admonition for leaders who might teach well, but cannot live up to their teaching. Those that teach are not so much held to a higher standard, but are held to at least the standard to which they claim. They tie together heavy packs that they do not try and lift. Everything they do, they do to be noticed by others. Reminiscent of Luke 14:7 where Jesus notices how the guests picked the places of honor. Remember, he had just summed up the whole law as “Love God, and love others as yourself.” If the tassels and fringes are meant to express love and devotion to God, there is no problem. When, however, they become about setting yourself over and above others, that is the problem. What do we do with clerical clothes? Is the collar appropriate? What about the robe, cassock, or stole? What is the motivation behind such things? Should non-ordained wear stoles? Where is the line between an easy burden and cheap grace? It is not the substance of the Pharisees teaching that Jesus takes issue with, it is the way that they apply it. It is hard to imagine a heavier burden than the cross (Matthew 16:24). But the cross is not a burden that Jesus was unwilling to take up himself. Joshua 3-4 has puzzled interpreters for generations. The crossing of the Jordan happens at least twice. This is an incredibly important event, “The act of crossing brings Israel from promise to fulfillment and changes Israel from a wandering people to a landed nation.” (Wesley Study Bible, notes on Joshua 3:1-4:24 p. 266). At the end of the Torah, there are two problems. There is a great nation, but they are not in the land. It ends just on the other side of the Jordan. There are people already there. Joshua 1-2 includes Joshua taking control as leader, as ordained by God, and preparations for the invasion, including sending spies into Jericho, the first great city across the river. In 3:1-6, there is instruction for the priests to carry the ark of the covenant before the people, and a warning to the people to stay away. The people also leave Shittim and go to the banks of the river in preparation. There is danger in the power vacuum of Moses’s death. The ark of the covenant - the singular presence of God - leads the way. Both the priests and the people are a part of this crossing over. There is a need for the priestly leadership, but all the people are represented as well. In ch. 4, there are 12 stones placed so that they can be a permanent reminder. It is pointed out that the river was particularly high. 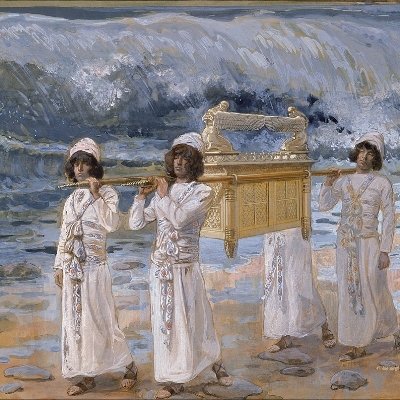 The priests bearing the ark go first, but “the priests who bore the ark of the covenant of the LORD stood on dry ground in the middle of the Jordan, until the entire nation finished crossing over the Jordan.” v. 17. The ark leads the way, but the people pass by the ark as well. This story is an important transition, one that is full of hope and dread. There is so much hope and good news in the fact that the Lord has led the people out of slavery. The period of wandering is over. The Lord stopped the waters (again) so that the people could pass over on dry ground (again). This ritual is an act of remembrance and renewal. The crossing over on dry land is a reminder that this is how the journey began. The crossing of the Sea of Reeds (or Red Sea) was the initial saving act for the people, and this is the fulfillment of the promise. It is also an act fraught with trouble, as they are crossing over into a land that is already occupied. War is coming. This cannot be ignored. Walter Brueggemann in a recent Pulpit Fiction interview: “God is recovering from violence.” God used violence in the occupation of the land - this cannot be avoided - but God recovers from the use of violence over the course of the Biblical story. This idea of God changing, growing, and adapting, is a troubling idea for some. Blasphemy for some, but a faithful reading of the text reveals that God, and especially the way in which God reveals God’s power, changes. If we are to be faithful to the text, we cannot ignore the conquest is a part of this story. Also be mindful of the laws that were already put forth in the Torah about how to treat the alien and the immigrant. Always, God reminds the people to treat them with justice because “you were once immigrants.” The story of the people coming into an occupied land remained an important part of the story of the people - and should remain so today. P, S and T are serving the for the sake of the Gospel, not the church, not their own fame or glory or edification. They are NOT claiming Paul (S &T) are gods. Is your church proclaiming the gospel of God or the Gospel of a particular denomination/ local pastor/ church/ political ideal?